Muse (alprostadil) is indicated as a medication against erectile dysfunction (ED), otherwise known as impotence. It is a unique approach, compared to other impotence treatments. 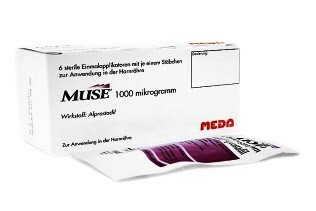 Muse is directly applied into the urethra and therefore has a fast effect on attaining and maintaining an erection. Effect within 5 – 10 minutes. Effects last approximately 30 – 60 minutes.